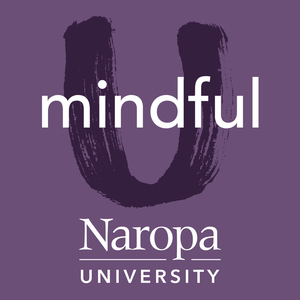 We found 8 episodes of Mindful U at Naropa University with the tag “naropa university”. "Meditation is so important—particularly training and concentration. How to steady and fix the mind until conceptual thoughts fall away. We live so much in our conceptualizing nature that we can't imagine life without that. But when you start doing this practice, you find out that you can conceptualize, and you cannot. So, learning how to drop into that stillness, as the Buddha calls it, until you come to the absolute stilling of all thought. We think well then, there's nothing. Yes, there is something beyond that, you could never see it before because you were caught in the cycle of conceptualizing. But the other side that the Buddha calls meditation—a pleasant, abiding here and now, touching kind of contentment and peace that the world didn't give you. So, the world can't take it away. But what he called practice was something entirely different. We just need to do more practice, and the practice is not to sit on the pillow. Sitting on a pillow is sitting on a pillow. But to practice is how we handle ourselves in every moment of our waking day—when one is accosting you, taking what is yours and what is criticizing you." "It's said in Tibetan medicine that you have to have all five elements plus karma in order to be incarnated at all. So, even to obtain the precious human body you have to have all five elements in karma. So you're going to choose certain parents and situations. They're going to give you some genetic factors which are going to influence your inner elements and then also you're going to have the diet and the behavior that your mother has during your pregnancy is going to influence it. The outer environment is going to influence it and then very early on in life -- your life situations are also going to influence it. So, family systems, psychology, all of that has an impact on the choices we make. So, somebody could be inherently one type of being and perhaps their family system either didn't recognize or support that and so they made a choice in order to compensate on a psychological level." Naropa University professor Brigitte Mars leads students and the overall community in understanding the value of herbs and plants to the body, the mind, and more. Today's episode focuses on Brigitte's work with Naropa students. Lief discusses his various roles at Naropa since its founding, and explains what makes Naropa University unique. He then gives an overview of the course he teaches at Naropa as a part of the Peace Studies undergraduate program, Social Innovation and Entrepreneurship.